The 102 lessons in this curriculum weave in values activities on peace, respect, love, cooperation, honesty, humility and happiness from Living Values Education Activities for Young Adults, with lessons related to drug use, emotional issues that arise with addiction and concomitant behaviors, and the building of social and relapse-prevention skills. It is designed for use with young people 14- through 26-years old but has been used in rehabilitation clinics with adults in their 40s. Living Values Education offers a special training to drug counsellors and drug rehabilitation facilities to learn to implement Living Values Education Activities for Drug Rehabilitation. This professional development workshop incorporates the elements of the regular Living Values Education Educator Workshop and adds sessions to practice skills and do the activities particular to this particular resource. This workshop varies in length. For experienced drug rehab counsellors with a history of active group facilitation, the workshop is three days. For drug rehab counsellors who have had little experience in participatory group methods and active listening, the training is usually six days. An Living Values Education Facilitator will consult with the requesting agency to determine the needs. Learn more about the Living Values Education Activities for Drug Rehabilitation materials and results. 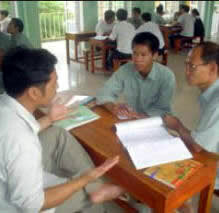 Living Values Education Activities for Drug Rehabilitation are used in many government drug rehab centers in Vietnam. The Ministry of Labor reported in March of 2008 that Living Values Education’s programme for drug rehabilitation was the most successful programme in government drug rehabilitation clinics. They had been using it for three years. A story from Vietnam: “Visitors to Binh Minh Village Drug Rehab Center in Ho Chi Minh City are amazed to see patients reading in a relaxed manner and walking around with smiles on their faces. They feel the secret lies in the Living Values Education programme which has been applied at Peace and Light Village since 2006. This year (written in 2015) Binh Minh Village’s English name is Peace and Light Village, or as they also call it, People and Living Values (PLV). once they return home from the Drug Rehabilitation Centre in Ba Vi, North Hanoi. PLV is a private rehab centre established in May 15, 2002. Using education as the key approach, the management here considers 80% of the success of the treatment process to be due to ‘mental therapy’. Based on the results achieved since its inception, PLV now applies two education programmes simultaneously to change the behavior of drug addicts: the 12-step programme and the Living Values Education’s programme for drug rehabilitation. They have observed that these two programmes together produce the best rehabilitation effect for even long-time drug users, especially during the two final stages of the rehab process: building a new life style, new behaviours, and helping peers. The Living Values Education programme has very practical skills which can be applied in reality. The founders of PLV had attended Living Values Education workshops conducted by Trish Summerfield since 2000. At that time, they found Living Values Education a simple but scientific, highly educative method, which could fit quite well with Vietnamese culture, especially for drug addicts. Living Values Education Activities for Drug Rehabilitation was created in 2005. They began implementing it in 2006. By the end of 2008, the positive results had won their hearts and infused them with inspiration. They then assigned a board member to focus on Living Values Education to become PLV’s trainer of Living Values Education.